When did you first take up skiing and how did you get on? It was 1953, I was five years old and I hated it! My mother, Cornelia, was Austrian and a strong skier. We went to Igls and Seefeld. Back then there weren’t really any lifts serving the beginner slopes, so I had to side-step up repeatedly. It was like some awful boot camp. I lost my temper one day, and threw my poles at my mother and shouted, “We’re meant to be on holiday!” She threatened to put me on the next train home so very reluctantly, I kept going. We went to St Anton when I was seven where I eventually learnt to ski properly and fell in love with it. It’s been in my blood ever since. Did you ever want to take up competitive skiing? When I was 15, and doing a bit of racing, my parents were approached in Lech by the then organisers of the British Olympic team, asking if I’d be interested in training to try and get on the squad. My parents thought it was more important to concentrate on my education and study for O-levels. It was the right decision. I don’t think I would have had the dedication to train from dawn to dusk, which you have to do if you want to be a ski racer. I wouldn’t have been able to stick to that kind of regime. Mind you, most days I write from dawn to dusk. Which are your favourite resorts today? I’m really fond of Courchevel and Verbier, but Zermatt is my favourite. I love the whole atmosphere there. It combines a great high street – relatively traffic free apart from those rather dangerous electric taxis that whizz around almost silently – with some of the best mountain restaurants and the best terrain. And I like the way you feel cut off from the troubles of the world. I’ve had some of my happiest times in Zermatt over the Christmas period, such as skiing with a plum pudding in my backpack to Zermatt’s celebrated Zum See restaurant, where we enjoyed a turkey dinner and our (now rather squashed) pud which the restaurant cooked for us. And taking part in torchlight descents, ending up in the very friendly Le Mazot bar. My favourite is Jackson Hole in Wyoming. It may only have a dozen lifts, but there’s great gung-ho backcountry there, like the Hobacks area for example which you can easily access from the main slopes. What sort of skis do you prefer? I was very fond of the old skinny skis and for some time resisted switching to carvers. I figured if you could ski well enough on the old skis you shouldn’t need to change. Just to prove my point, I won a few races with friends who had switched to carving skis. But in the end I reluctantly succumbed and do find them better all-terrain skis especially in powder, slush and spring snow – being that much shorter they are easier to turn. I tend to rent these days as I like to try the latest models. 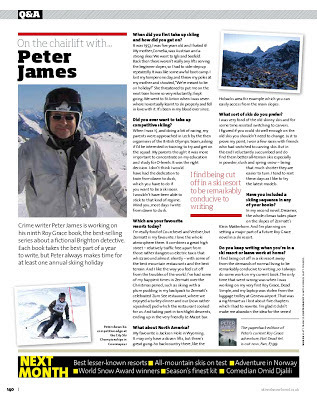 Have you included a skiing sequence in any of your books? In my second novel, Dreamer, the whole climax takes place on the slopes of Zermatt’s Klein Matterhorn. And I’m planning on setting a major part of a future Roy Grace novel in a ski resort. 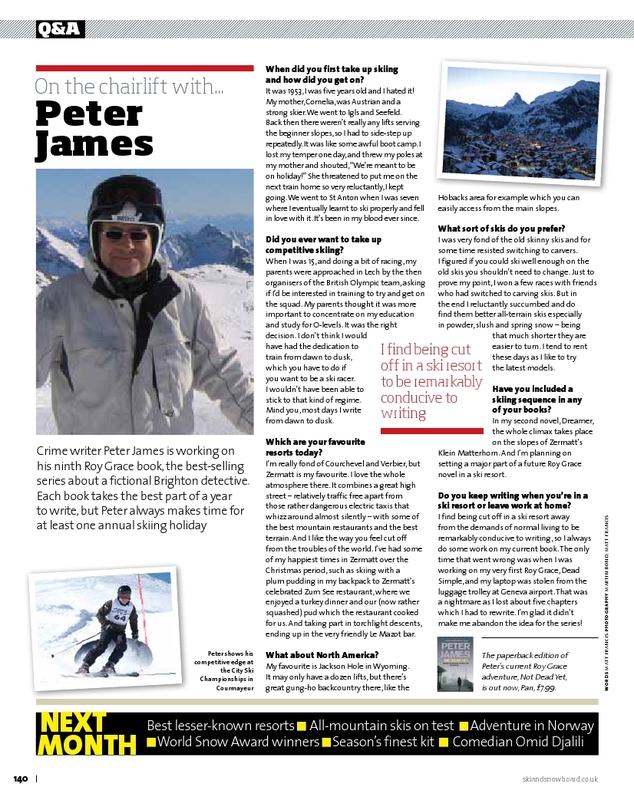 Do you keep writing when you’re in a ski resort or leave work at home? I find being cut off in a ski resort away from the demands of normal living to be remarkably conducive to writing, so I always do some work on my current book. The only time that went wrong was when I was working on my very first Roy Grace, Dead Simple, and my laptop was stolen from the luggage trolley at Geneva airport. That was a nightmare as I lost about five chapters which I had to rewrite. I’m glad it didn’t make me abandon the idea for the series!